For those of you gearing up to take off on an adventure, even if it’s for a charter or small passage, do yourself a favor and go to your local library. I went to Helen Hall Library in League City before we left, the same one I went to back in high school. Internet – Libraries are not just for books! Most libraries in the US have wifi now, and – remember this from when you were a student? – they have computer stations. An excellent way to access the internet for free when wifi is scare and data plans expensive. Zinio – You can also download digital versions of magazines for free, if your library has partnered with Zinio and RBDigital. This includes Cruising World magazine. Sadly, our library at home has not done this yet. OverDrive – This is what I have used the most. OverDrive allows you to check out up to 10 books or audiobooks at a time – great for stocking up for a passage. Books can be wirelessly delivered to your Kindle. I haven’t been using the audiobooks much yet, but I think it’ll be great for entertaining myself during passages. 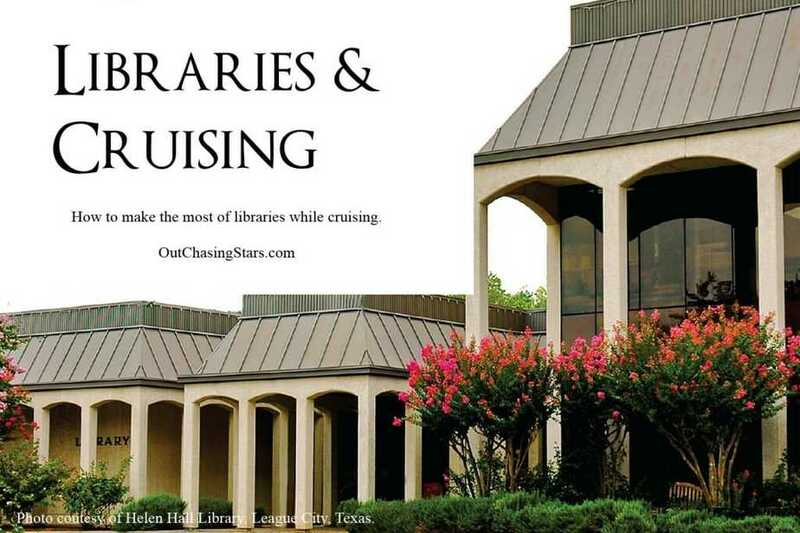 Events & Activities – While in a new harbor and looking to meet people, make friends, or just have something to do, the library has a lot of options available. The Manatee County library near us here in Palmetto has book clubs, classes, lectures and lots of activities for families and kids. If you can prove residency, you can get a free library card. However, the Manatee County library system has a program for non-residents. For $20 per year or $100 for a lifetime membership, non-residents can get a card and use the library’s resources. You don’t have to be a member to enjoy most of the on site services of the library. Thank you for this. Just registered with my library and downloaddd RBDigital so I can read Cruising World. Libraries are the best government provided service second only to public schools. I spent many a day at my local library growing up. Love, love, love visiting libraries when I travel. Remember the Troy Library with all the Tiffany glass? I do remember the Troy library! My mother instilled a love and appreciation of libraries into us and my sister ended up becoming a librarian, so I can really appreciate this post. Libraries are a fantastic community resource! Yes they are! Thanks for reading! If I may, I’d also recommend the app Issuu — it’s how I get ALL of the Latitude 38 magazines free along with many other yachting & sailing magazines (such as Multi Hulls) etc. Most are free and can be stored in the app for offline reading. Also, while not for books per se, probably my #1 app for years has been Instapaper. You can save anything you find on the web that you’d like to read (from your iPhone, iPad, or Mac) very easily and it will be stored as perfectly formatted text for reading offline OR listening (there’s a single ‘speech’ button and it will read aloud to you ANY text you’ve saved). I like it so much I pay a voluntary subscription fee quarterly, but this is not necessary to get 95% of the benefits of it. This is how I read/listen to New York Times, Fortune, Harvard Business Review, etc. and even how I save and read your posts! Very cool! Thanks for the tips!